It’s the night before your big maths exam and you are STRESSED. You’re cramming in work, books are everywhere, chip packets are strewn across the floor, your friends are begging you to stop calling them for help and that Red Bull you inhaled is just not working anymore. This is the moment where you tell yourself yet again that you will start to study sooner next time. Disaster seems imminent. Sound familiar? Ask yourself this: what IF you had indeed started to study earlier and felt calm and prepared for your exam? Yes, it appears to be the unholiest of sins to actually study ahead, however, when you are in grades 10, 11 and 12 you have to make the decision to start studying in an effective manner and to have a strategy when tests and exams are looming, as they are your ticket to further education. When you have made the decision to up your game and say “yes” to the madness that pre-exam preparation appears to be, here are the top ten study strategies to help you achieve your goals. Do you prepare appropriately for tests? Do you know how to compartmentalize your subjects and separate the amount of work? Do you know how to study effectively for each subject according to the type of work? Do you work through past exam papers and answer them in the correct way? Once you have answered these questions, brace yourself. You are about to learn what it is to study in a manner that will not only raise your marks, but allow you to study faster and more effectively. Sitting down? Ready to have your tired mind blown away, as you are shown the light that is strategic studying? Right, let’s go. We know what you are thinking. Lack of time is why you are reading this article in the first place. However, you can take effective steps right now to planning for your next test series or exam period. Make sure to take note exactly when exams or tests are scheduled and what the dates are for each subject. Use a calendar and mark down each upcoming examination. This will act as a constant reminder for you to begin with work. We suggest writing dates in red as this colour creates a sense of urgency. When you know you have three weeks to study for that dreaded science final you will feel more motivated to start focusing each time your eye catches the calendar dates. This may come as a surprise, but those 2 week old bowls of Futurelife do not have to stay on your desk. A desk is actually meant for textbooks and study notes and all kinds of scary school related paraphernalia. Ensure that your desk is free of debris and dirty laundry. See to it that you have adequate lighting, notepaper, pens, high-liters and anything else you may need. Colourful sticky notes are very helpful when you need to remember important facts and details. This is one of those times when your mother really is right: Organize your room, it will in fact benefit you. Take this opportunity to revert back to your youth and draw pictures, use colour and make fun flow charts to not only make your work more user friendly, but revise at the same time. By making mind maps and diagrams you are re-learning your study material as you make your own summaries and short hand notes. You can even paste these up on your bedroom wall or cupboard doors so that you read them more often than you would had they simply been in a notebook. Ask yourself this: do you focus entirely on your work when you study? Or does your attention tend to mosey towards everything except that stomaching turning Mathematics textbook? Is your Wattsap distracting you as that friendly little “ping” goes off yet again and you return two minutes later to the same page for what seems to be the thousandth time? One of the most important factors while studying is your environment. You may genuinely think that you are more than capable of concentrating with your little brother crashing and playing in the background, but the fact is you cannot. Yes, he may desperately need your help fighting off pretend ninja assassins but that simply will not aid you in any way when it comes to exams. Make the effort to work in silence and without any people around you (unless in an interactive study group). Switch your phone to silent and turn off the radio or TV. As little as 40 minutes spent completely focused on work is more worth it than 2 hours spent dawdling. The use of a study group is an incredibly helpful tool when preparing for exams. Take the time to sit down with class mates and friends and discuss questions and issues that you all may be experiencing with work. In this way, you have the advantage of not only receiving help from those who are studying the same work as you are, but by helping others you be effectively “re-teaching” what you have learnt and revising your studies. Keep in mind, however, that study time has to be spent studying and not wholly focused on what you are wearing to the upcoming weekend’s parties, as utterly important as this may be. Unfortunately this does not entail working for 20 minutes and then relaxing for 45 minutes, as we had all hoped. Each individual is different and has their own unique way when preparing for tests and exams. We do, however, all need to take a break. Go on, have that Kit Kat and put your feet up once in a while. A productive 45 – 50 minute study session deserves a 10 – 15 minute relax. Go for a walk, mess around with the dog or make a snack to switch your brain off before you continue with your work. Keep in mind, though, that this needs to be controlled. Set an alarm to tell you exactly when it is time to return to the abyss and pick up where you left off. Having small study breaks between work sessions will do your mind the world of good. We are all guilty of reaching for that tempting tube of Pringles rather than that lame looking banana, when we get the study munchies. The problem with this is that not only do those Pringles not help our waistlines, but it does not actually fill or sustain us while we work. Junk food is quickly absorbed in our bodies and has no beneficial worth when it comes to studying. Discipline yourself to eat foods that feed your brain, such as nuts or fruit or a healthy sand which. By snacking on good foods we in fact fight off lethargy and sugar crashes when we come down from that junk food high. 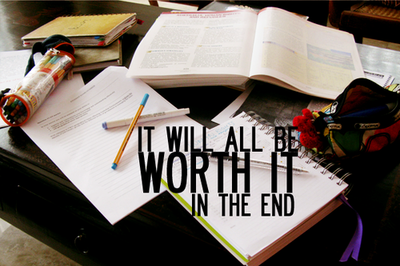 For the majority of us, the day before an important exam is a bit of a nightmare. We are trying in vain to force last minute facts into our brains and having a general meltdown as we have to face the truth that we left things too late and are going to have to pull an all-nighter just to scrape through. By sticking to a study schedule and having a game plan you will experience the benefit of having revised and practised all you needed to and entering into an exam feeling rested and ready for action. The above heading alone can create feelings of anxiety and beads of sweat on most of our foreheads as those final few hours before your exam make you feel as if a seizure is forthcoming. But wait, there is hope! By following the previous 9 steps and having practiced some good old discipline you will not have to endure such suffering any longer. Eat a proper breakfast before each exam: hunger pains break concentration. Get enough sleep the night before. Arrive early for each exam so that you are not harried and disorientated when you start. Have enough stationery on hand as well as any other tools such as calculators etc. Read slowly through each section of your paper and circle any questions you may not understand. Listen carefully to instructions from teachers as they may clear up issues you might have. Answer the questions you are most comfortable with first as you will gain the most marks there. Leave the more difficult questions for later. Work according to the time you are allocated. Do not spend 30 minutes on one question when you have one hour to complete an entire test paper. Keep track of the time while answering. When experiencing difficulty with a particular question do not berate yourself for what seems to be hours, while you continue to struggle but not achieve anything other than sheer misery. Move on to the next question and return later. Ensure that you check your work before you submit your paper, but do not make the mistake of changing answers three times. More often than not, your first answer was correct. When following a study schedule we remain constantly aware of what we need to do in order to obtain the results we want. We are able to keep track of progress and afford ourselves enough time to prepare in the best way possible. Yes, it may seem like an incredible waste of time to “plan to study”, but it will make the difference you truly need to raise your marks, and the beauty of it is this: when you raise your marks and your success is visible, your self confidence is raised too.